White Dwarf Stars In The Universe. White dwarf star are main sequence stars. White dwarf stars is the kind of star which a main-sequence star of low or medium mass will become in the last stage of its evolution. After such a star has become a red giant during its helium-burning phase, in which helium is fused to carbon and oxygen by the triple-alpha process, it generally has insufficient mass to generate the core temperatures required to fuse carbon. After shedding its outer layers to form a Planetary nebula, it will leave behind an inert core, which forms the remnant white dwarf. Usually, therefore, white dwarfs are composed of carbon and oxygen, although some helium white dwarfs appear to have been formed by mass loss in binary systems. It is also possible that core temperatures suffice to fuse carbon but not Neon, in which case an oxygen-Neon-magnesium white dwarf may be formed. Image of Sirius A and Sirius B taken by the Hubble Space Telescope. Sirius B, which is a white dwarf star, can be seen as a faint dot to the lower left of the much brighter Sirius A. The material in a white dwarf no longer undergoes fusion reactions, so the star has no source of energy, nor is it supported against Gravitational collapse by the heat generated by fusion. It is supported only by electron degeneracy pressure and is therefore extremely dense, with a typical mass on the order of the Sun's contained in a volume on the order of the Earth's. The physics of degeneracy yields a maximum mass for a white dwarf, the Chandrasekhar limitapproximately 1.4 solar massesbeyond which it cannot be supported by degeneracy pressure. A carbon-oxygen white dwarf which approaches this mass limit, typically by mass transfer from a companion star, may explode as a Type Ia supernova via a process known as carbon detonation. A white dwarf is very hot when it is formed, but since it has no source of energy, it will gradually radiate away its energy and cool down. Over hundreds of billions of years, it will cool to temperatures at which it is no longer visible. However, since no white dwarf can be older than the age of the Universe (approximately 13.7 billion years) even the oldest white dwarfs still radiate at temperatures of a few thousand kelvins. As a class, white dwarfs are fairly common; they comprise roughly 6% of all stars in the solar neighborhood. Formation and types of white dwarf star. White dwarfs are thought to represent the end point of stellar evolution for main-sequence stars with masses from about 0.07 to 10 solar masses. The type of white dwarf produced, however, will differ depending on the initial mass of the star. White dwarf stars with very low mass. If the mass of a main-sequence star is lower than approximately half a solar mass, it will never become hot enough to fuse helium at its core. It is thought that, over a lifespan exceeding the age (~13.7 billion years) of the Universe, such a star will eventually burn all its hydrogen and end its evolution as a helium white dwarf composed chiefly of Helium-4 nuclei. Owing to the time this process takes, it is not thought to be the origin of observed helium white dwarfs. Rather, they are thought to be the product of mass loss in binary systems. White dwarf stars with low to medium mass. White dwarf stars with medium to high mass. Characteristics of white dwarf stars. Many white dwarfs are approximately the size of the Earth, typically 100 times smaller in diameter than the Sun; their mass is typically about 0.50.6 solar masses, though there is quite a bit of variation. As a mass comparable to the Sun's is packed into a volume that is typically 106 = 1,000,000 times smaller than the Sun, the average density of matter in a white dwarf must be approximately 1,000,000 times greater than the average density of the Sun. White dwarfs are therefore composed of one of the densest forms of matter known, surpassed only by other Compact stars such as neutron stars, black holes and hypothetical quark stars. If matter of this density is sufficiently cool, its electrons will be in a state called degenerate. This is a quantum-mechanical condition in which the quantum states of the electrons fill the bottom of the Fermi sea. A consequence of this is the existence of electron degeneracy pressure, which, as explained in a 1926 paper by Fowler, supports the white dwarf. This pressure only depends on density and not on temperature. Degenerate matter is relatively compressible; a consequence of this is that the density of a high-mass white dwarf is so much greater than that of a low-mass white dwarf that the radius of a white dwarf decreases as its mass increases. Another consequence of being supported by electron degeneracy pressure is the existence of a mass limit for white dwarfs, the Chandrasekhar limit. For a nonrotating white dwarf, it is equal to approximately 5.7/Âµ2 solar masses, where Âµ is the average molecular weight per electron of the star. As the carbon-12 and oxygen-16 which predominantly compose a carbon-oxygen white dwarf both have atomic number equal to half their atomic weight, one should take Âµ equal to 2 for such a star, leading to the commonly-quoted value of 1.4 solar masses. If a white dwarf were to exceed this limit, and nuclear reactions did not take place, the pressure exerted by Electrons would no longer be able to balance the force of gravity, and it would collapse into a denser object such as a neutron star or black hole. 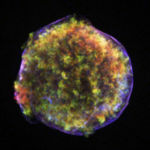 However, carbon-oxygen white dwarfs accreting mass from a neighboring star undergo a runaway nuclear fusion reaction, which leads to a Type Ia supernova explosion in which the white dwarf is destroyed, prior to reaching the limiting mass. White dwarfs have low luminosity and high temperature and therefore occupy a strip at the bottom of the Hertzsprung-Russell diagram. They should not be confused with the low-temperature red dwarfs, supported by thermal pressure, or the even lower temperature brown dwarfs, both of which occupy the low-mass end of the main sequence. Cooling of white dwarf stars. Most white dwarf stars are extremely hot; hence the white color of the light they emit. This heat is a remnant of that present in the progenitor star, and, unless the white dwarf accretes matter from other nearby stars, it is not replenished. However, since white dwarfs have an extremely small surface area from which to radiate this heat, they remain hot for a long period of time. Although white dwarf matter is initially plasma, i.e., a fluid composed of nuclei and electrons, it is thought that at a late stage of cooling, the nuclei crystallize into a body-centered cubic lattice, starting at the center of the white dwarf. Asteroseismological observations suggest that a substantial fraction of the white dwarf BPM 37093 has already crystallized. Eventually, a white dwarf will cool into a Black dwarf. Black dwarfs are ambient temperature entities and radiate weakly in the radio spectrum, according to theory. However, the universe has not existed long enough for any white dwarfs to have cooled down this far yet; no black dwarfs are thought to exist, and one of the coolest white dwarfs observed, WD 0346+246, has a temperature of approximately 3900 K. Cooling of a white dwarf slows as it progresses. A white dwarf may cool from 20,000K to 5,000K in approximately the same amount of time it takes to cool from 5,000K to 4,000K. White dwarf stars: Type Ia supernovae. The mass of an isolated white dwarf cannot exceed the Chandrasekhar limit of ~1.4 solar masses. White dwarfs in binary systems, however, can increase in mass by accreting material from a companion star. If the accreted material were to push the mass of the white dwarf beyond the limit, degeneracy pressure would no longer support the star, and an electron-capture collapse would ensue. Prior to this collapse, however, the central density of the star will increase. In a carbon-Oxygen white dwarf, it is believed that, as a result of compressional heating, its temperature also increases, resulting in an increasing rate of fusion reactions. Because the white dwarf is supported against gravity by quantum degeneracy pressure, not by thermal pressure, adding heat to the star's interior increases its temperature, but it does not increase its pressure, so the white dwarf does not expand and cool in response. Rather, the increased temperature increases the rate of the fusion reaction, in a process that feeds on itself. This eventually leads to the ignition of a thermonuclear flame, which quickly causes an explosion that obliterates the white dwarf. 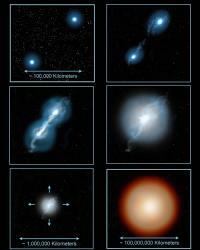 This is thought to be the origin of Type Ia supernovae. White dwarf stars: Cataclysmic variables. When accretion of material does not push a white dwarf close to the Chandrasekhar limit, hydrogen-rich accretion material on the surface may still light up in a thermonuclear explosion. Since the white dwarf's core remains intact, these surface explosions can be repeated as long as accretion continues. This weaker kind of repetitive cataclysmic phenomenon is called a (classical) nova. Astronomers have also observed Dwarf novae, which have smaller, more frequent luminosity peaks than classical novae. These are thought to not be caused by fusion but rather by accretion of material onto the white dwarf's surface. In general, binary systems with a white dwarf accreting matter from a stellar companion are called Cataclysmic variables. As well as novae and dwarf novae, several other classes of these variables are known. White dwarf stars: High-energy emissions. Both fusion- and accretion-powered cataclysmic variables have been observed to be X-ray sources. In addition, isolated, young white dwarfs have been observed to be sources of soft i.e., lower-energy) X-rays. This enables the composition and structure of their atmospheres to be studied by soft X-ray and extreme ultraviolet observations. Evidence exists that the remnants of a white dwarf's planets and comets may frequently collide, releasing dust. It is possible that infalling material from this may cause X-ray emission from the white dwarf. White dwarf stars: Mass-radius relationship. and ? (r) is the density as a function of the radius. This derivation will show that higher-mass white dwarfs will have a smaller radius. 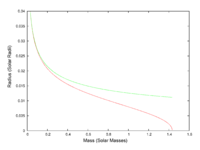 Radius versus mass for a model white dwarf. For a more accurate computation of the relationship of the mass and radius of a white dwarf, one must allow both the density and pressure to vary with the distance from the center of the white dwarf. Relativistic corrections will also alter the result, so that the radius becomes zero at a finite value of the mass. This is the Chandrasekhar limit for the mass, giving the value of the mass at which the white dwarf can no longer be supported by electron degeneracy pressure. The graph at the right shows the result of such a computation. It shows how radius varies with mass for non-relativistic (green curve) and relativistic (red curve) models of a white dwarf. Both models treat the white dwarf as a cold Fermi gas in hydrostatic equilibrium. The average molecular weight per electron, Âµ, has been set equal to 2. Radius is measured in standard solar radii and mass in standard solar masses. History of discoveries of white dwarf stars. During the nineteenth century, positional measurements of some stars became sufficiently precise that small changes in their location could be measured. 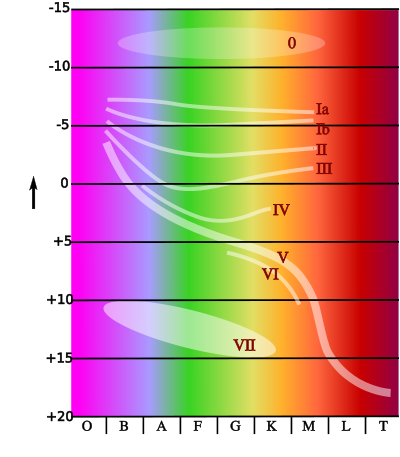 Friedrich Bessel used just such precise measurements to determine that the star Sirius (Alpha Canis Majoris) was changing its position (for reasons unrelated to the parallax effect). In 1844 he predicted that Sirius had an unseen companion, and gave an estimate of the orbital period. It was not until 1862 that Alvan Graham Clark discovered this dark companion of Sirius. The companion, called Sirius B or the Pup, had a surface temperature of about 25,000 K, so it was classified as a hot star. However, Sirius B was about 10,000 times fainter than the primary, Sirius A. Since it was very bright per unit of surface area, the Pup had to be much smaller than Sirius A, with roughly the diameter of the Earth. Analysis of the orbit of the Sirius star system showed that the mass of the Pup was almost the same as that of our own Sun. This implied that Sirius B was thousands of times more dense than Lead. As more white dwarfs were found, astronomers began to discover that white dwarfs are common in our galaxy. In 1917 Adriaan Van Maanen discovered Van Maanen's Star, the second known white dwarf. After the discovery of quantum mechanics in the 1920s, Fermi-Dirac statistics, which electrons obey, were introduced in 1926. A few months after this, R.H. Fowler explained in his paper "On Dense Matter" how electron degeneracy pressure could support a white dwarf. Limiting masses for white dwarf stars were first published in 1929 by Wilhelm Anderson and in 1930 by Edmund C. Stoner. The modern value of the limit was first published in 1931 by Subrahmanyan Chandrasekhar in his paper "The Maximum Mass of Ideal White Dwarfs". (At the time, stars were believed to be composed chiefly of heavy elements, so Chandrasekhar set the average molecular weight per electron, Âµ, equal to 2.5, giving a limit of 0.91 solar masses. Setting Âµ equal to 2, as appropriate for a carbon-oxygen white dwarf, yields the modern value of approximately 1.4 solar masses.) Together with Fowler, Chandrasekhar received the Nobel prize for this and other work in 1983. The limiting mass is now called the Chandrasekhar limit. NASA's Spitzer space telescope has recently spotted what may be Comet dust sprinkled around the white dwarf star G29-38, which died approximately 500 million years ago. The findings suggest that the dead star, which most likely consumed its inner planets, is still orbited by a ring of surviving comets and possibly outer planets. This is the first observational evidence that comets can outlive their stars. In 2004, a team of researchers from Harvard-Smithsonian Center for Astrophysics led by Travis Metcalfe suggested, on the basis of Asteroseismological observations, that a large portion of the mass of the white dwarf BPM 37093 had undergone crystallization.